Very little is known about Mzee Kenyatta’s Bamburi home – only that this was his escape away from the power trappings of State House, Mombasa, when he was on a tour of the coast. As an archival file on Bamburi beach cottage now shows, the late President Kenyatta could relax here and enjoy the Ocean breeze with minimal security around him. The new archival file allows us to peep into the private life of President Kenyatta: His love for Njahi, citrus fruits, coconut trees, flowers and goats! All these were brought to Bamburi. The file also brings out an issue that few Kenyans would believe: Government officials always refused — and in writing — to pay Kenyatta’s private bills and billed him for any service rendered to him. That would be surprising for a man whose private life has been thought to be mixed with his public one. But the most hilarious story is that of Kenyatta’s goat herdsman who was left to take care of the President’s new swimming pool. But by the time Mzee returned to the coast, he found that the water had turned green with algae. Mzee complained and senior government officials had to seek a solution with samples sent to Nairobi to establish the problem. It would later emerge that the herdsman only turned on the circulation system when he heard that Kenyatta was on the way! The swimming pool issue would lead to some war of words between Defence Minister, Dr Njoroge Mungai, and Kenyatta’s private secretary, Eliud Mathu. This was after Dr Mungai had decided — without consulting Mr Mathu — to order some lime from Smith Mackenzie & Company to clean the pool. Since there was no Local Purchase Order, the company thought they should bill State House, Mombasa and the bill ended up on Mr Mathu’s desk. Mr Mathu and Dr Mungai were not the best of friends, anyway, and the Comptroller refused to pay for the lime: “As I gave no authority for this expenditure, I suggest that correspondence should be carried out between yourselves, Smith Mackenzie & Company and the person who placed the order,” he wrote. Since there was no further correspondence on this — and most likely Kenyatta was never informed of the lime — perhaps Dr Mungai had to foot the bill. What we know from the file is that the District Hydraulic Engineer, Mr B.P. Grover, wrote a letter to Mathenge (to advise the goat herder) that the circula “even when the pool is not being used.” He also asked Kenyatta to pay £50 per year and the water department would maintain the swimming pool for him. The idea was that State House could not meet any of Kenyatta’s bills on his private life. That would surprise those who think that there was a thin line between Kenyatta’s private life and presidency. It was also a tricky balance by the civil servants on what to do with such a private residence. The Minister for Agriculture Mr Bruce MacKenzie — the ex-Mossad man with classic mutton-chop whiskers — took it upon himself to make sure there were trees, grass and flowers in the compound and he gave the instructions to the agricultural department to do so. It would later bill Kenyatta for this apart from the soil which was received from the Municipal Council of Mombasa. This request was granted by the town clerk Mr N.M. Adembesa, in a letter dated December 22, 1966 but had to be approved by the Minister for Local Government, Mr Lawrence Sagini. The matter had also been tabled at the council for approval during the December 6, 1966 meeting and recorded under Special Finance Minute No 1917/66. When an electricity account was created, it was in the name of Mr Charles Njonjo, the Attorney-General, perhaps an indicator of how close the two were – or that Mr Njonjo co-owned the property. Actually, initial purchases for the house were billed to Mr Njonjo. The acquisition of the private plot also left the provincial engineer handling a new problem — access and security. This was because there were private plots next to Kenyatta’s and State House wanted the security of the President guaranteed. The problem, according to Mr James H Omolo, then coast engineer, was that the fairly loose sand extended to a depth of 17 feet below the ground level of the plot. The engineers had found that the wall could only be built with pillars and the space between filled with honey-comb brick work. “I cannot think of an alternative without getting upto my ears in sand,” said the engineer. The work on the wall was given to Bamburi Portland Cement – and every day, some of the senior officials would be stopped at the gate for hours until they had to seek Mr Mathenge’s intervention. “Yesterday, I was twice delayed quite considerably,” wrote I.R Roberts, the Bamburi Cement general manager who was going to inspect the works in a letter dated September 30, 1966. This was because Defence Minister Dr Njoroge Mungai had on September 9, 1966 gazetted the beach house and adjoining premises as a Protected Area. “No person shall be in such protected area without the permission of the President, Minister for Defence, Minister for Home Affairs and Attorney General,” read the Order. Bamburi Cement would later use that opportunity of access, when advising Kenyatta on the colour schemes of the house, to tell him of the problems that Tanzania’s President Julius Nyerere had brought to the firm after he nationalised the banks. Mr Roberts told Mr Kenyatta that Tanzanians owed the company £130,000 and “we have not yet received payments for the cement supplied”. Work on this property would go slow because at times, Kenyatta would have to be on the ground to make inspections on what tree was to be removed. Again, it was taking time before bills reached Mr Mathu. This is because most contractors were writing bills to whichever ministry they thought would handle the matter. When Mr R. Da Gama Rose of the Kwale District Agricultural Officer invoiced Sh10 for some 20 coconut seedlings from the Msambweni Nursery, the PC Mr Mahihu wrote back: “Let me know whether the 20 coconut seedlings were supplied to State House or the president’s cottage at Bamburi.” It then turned out they belonged to State House and Mahihu wrote that the bill should be invoiced to State House. Further analysis of this well showed that the water was not even suitable for agriculture. By then, Mr Kenyatta had told his inner circle of his desire to have fruits on the farm. With this failure, the Department of Water sent a consumer’s agreement to Kenyatta to sign and this was again diverted to Mr Njonjo by the Provincial Commissioner. “Please sign it as the applicant and return the form to me so that I can send it to the officer in charge,” wrote Mathenge. Another interest Mr Kenyatta had were citrus fruits and pineapple suckers and some 2,000 were planted by Shah Virn. At one point, Mamujee Brothers Limited had wrongly invoiced the Provincial Accountant for work done in Bamburi. “Any correspondence in connection with the above outstanding account (Sh5,163) should be addressed to the Private Secretary…I have nothing to look into… I am sorry for the inconvenience but I have no alternative,” wrote Mr A. O. Achoki while refusing to pay any bills from government coffers for the President. Any time that Mr Kenyatta would see a tree that he had an interest in, he would call Mathu and ask him to have the same delivered to Bamburi. At one point, some nine Ficus Benjamina had to be railed from Nairobi to Mombasa. Some of the requests were interesting though. There was a time the Maize and Produce Board was asked to send black Njahi to Bamburi for a planting experiment that Kenyatta wanted to embark on. The General Manager E.M. Gaitho dispatched the same to Bamburi. Some more cow peas were bought from Shah Virchand Karamshi. We don’t know whether they ever germinated. Keeping goats at Bamburi was also a challenge because they would often get sick. The coast veterinary officer Mr G.R. Duncanson would normally visit the plot, administer drugs and send the invoice to Kenyatta’s private secretary. Once Kenyatta finished building some villas here too, he rented some to his friends and they had to use a side entrance to the Bamburi Farm from Ocean View Hotel. Some of these were Joseph Murumbi and Mr J Bambridge who leased the property from 21 August 1966 to 20 August 1967. Both Murumbi and Bambridge were business partners and had founded the real estate company, Bambridge, Murumbi and Tyson together with George Tyson and Viscount Mandeville. There were other cottages in the compound rented by companies for the managers. 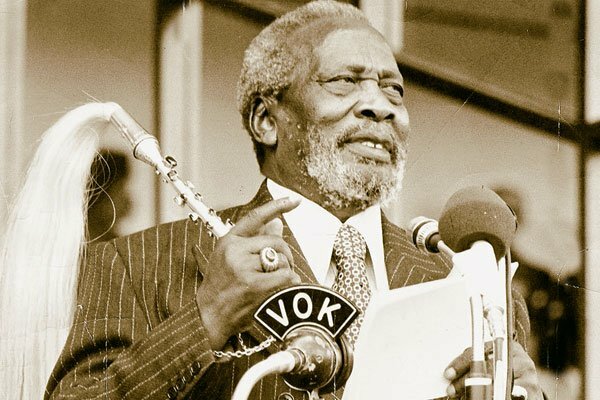 But they always had problems with State House sentries and once Dr Njuguna Gakuo, the East African Railways and Harbours General Manager and father of First Lady Margaret Kenyatta — had once been refused entry when he was taken to view the cottage rented by the railways for his use. And that was life in Bamburi. The untold stories of Kenyatta’s private Bamburi posh residence Reviewed by samrack on January 21, 2018 .